The 1,200-acre Tassajara Fire claimed a life less than 24 hours after it sparked in Monterey County. Firefighters have made progress in containing two wildfires that broke out over the weekend in Monterey County. The Tassajara Fire that started around 3 p.m. Saturday and has burned 1,086 acres was 65 percent contained as of Tuesday morning, Cal Fire officials said. 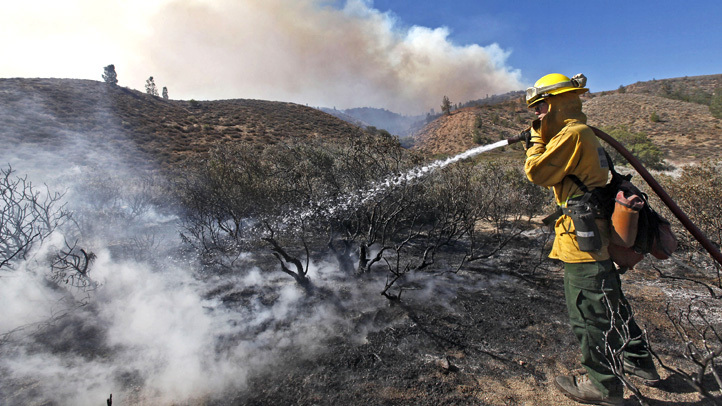 The blaze started in the area of Tassajara and Carmel Valley roads, officials said. A man's body was found just outside a car in the fire area and it appeared he died from a suicide, but the cause of death is still being determined, Monterey County sheriff's officials said. On Monday evening, a man allegedly pushed and attempted to punch a firefighter who asked him to leave his home in the 37700 block of Tassajara Road because of safety concerns, sheriff's officials said. The man, later identified as 63-year-old Jack West, was arrested on suspicion of battery and booked into county jail, according to the sheriff's office. Fire officials initially said 10 homes were destroyed in the fire, but damage inspection personnel on the site Monday determined that the blaze destroyed 11 homes and seven outbuildings and damaged one other home, fire officials said. There are 754 fire personnel working today to contain the fire, an increase from 590 the day before, according to fire officials. On Monday afternoon, evacuation orders and advisories were lifted outside the fire perimeter, fire officials said, adding that people are still being told to not enter the fire perimeter. An evacuation center set up by the American Red Cross at Carmel Middle School was closed as of 8 a.m. Tuesday, fire officials said. Road closures remain in place at Cachagua Road at Madrone Road, Poppy Tree Lane at Buckeye Road, Tassajara Road east of Buckeye Road and Tassajara Road south of East Carmel Valley Road, they said. One-way traffic control is in place at East Carmel Valley Road south of Tassajara Road because of fire equipment blocking the roadway, according to fire officials. About 20 miles away, the Laureles Fire that burned 95 acres started around 3:30 p.m. Saturday at the Laureles Grade and state Highway 68, fire officials said. As of Tuesday morning, the fire was fully contained, they said. There were no injuries, destroyed structures or evacuations in the fire, according to Cal Fire. The cause of both fires is under investigation.